Those in the alternative investment space have long trumpeted the power of alternative investments (and particularly managed futures) to perform in a stock market crisis (see our evidence of that here and here). 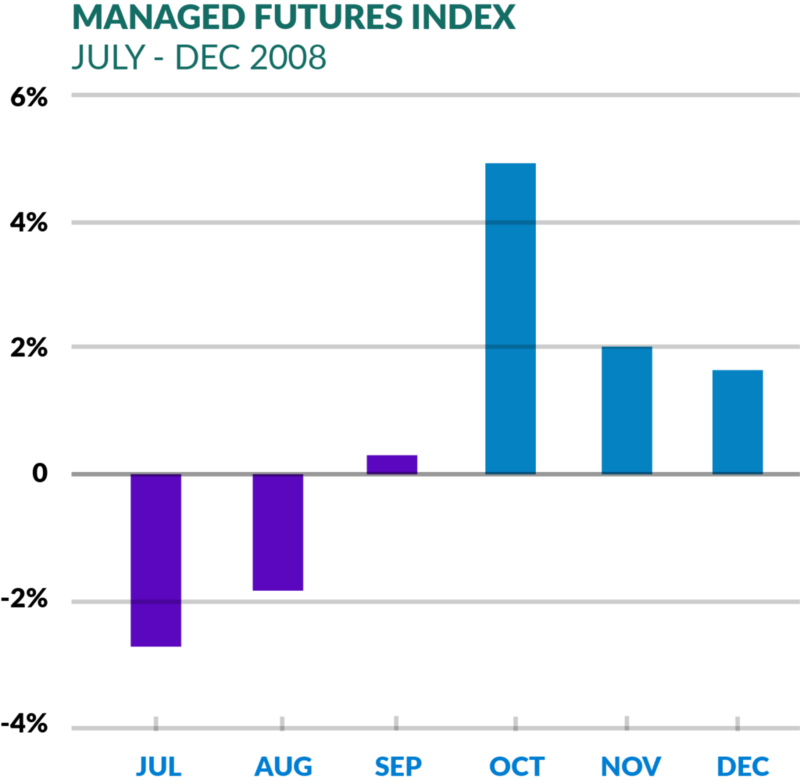 There’s no doubting that managed futures have performed during past crisis periods, but as the disclaimer says – past performance is not necessarily indicative of future results – and we are looking at a lot of red for managed futures this month. You have bellwethers such as AQR down about -4% from their highs in early October, and the ScoGen CTA index having put in a new five year low point (yikes), down nearly -7% on the year. So where is the crisis period performance? What gives? Well, as always – the devil is in the details. 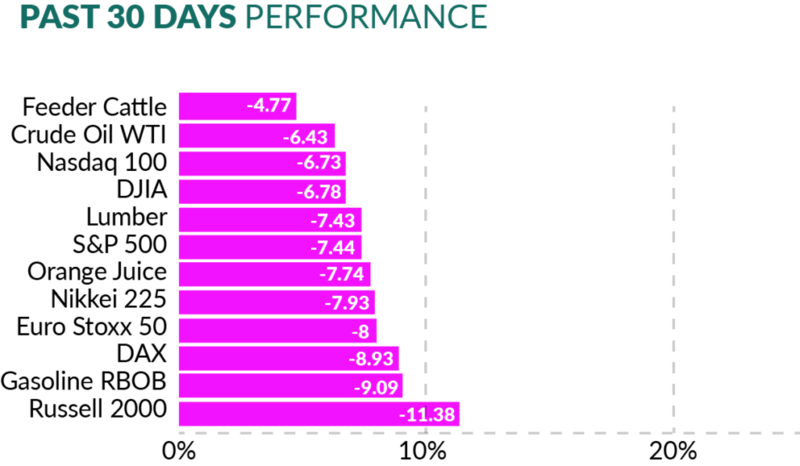 You see, when we talk about crisis period performance for managed futures, we’re talking about periods longer than a single day, week, or even month. We’re talking about periods in which traditional investments see major shifts (2007 to 2008 is the classic example, when stocks and commodities fell over several months). You see, crisis periods have two parts. One is the crisis itself, which usually causes a reversal of the current market trend (in this case current trend was stocks, foreign currencies, and energies up; bonds and US Dollar down). The second part is the aftermath of the crisis in which new market conditions and trends emerge. Why did they essentially mirror stock market performance when they are a non-correlated investment? Isn’t this what we have them sitting around for – to perform during a down move in US stocks? A few ideas there. One, there was a clear up trend in stocks (and down trend in bonds) coming into both February and this October correction. Trend following models are designed to capture such trends across asset classes (including, for sure, stock indices and bonds). And there was a clear reversal of that trend. 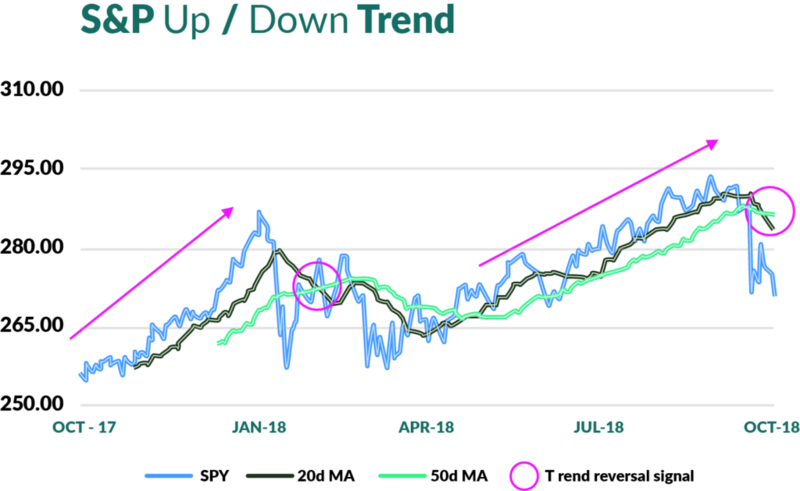 But, as we can see with a look at a simple 50 day/200 day moving average cross over trend following setup on the S&P 500, the signal of a down trend in the S&P was well after the bulk of the move had happened. And this is a rather quick trend following signal, using just 20 days and 50 days, whereas some managers may be out much further at 100 and 200 days. The result – these programs were slow to reverse to the down side, given the quickness of the move in relation to how slowly prices had risen before hand. What’s more, some of this slowness to react may be intentional. 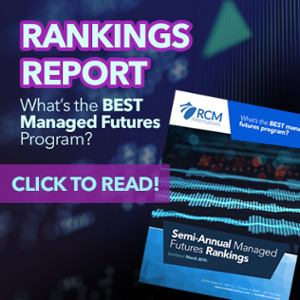 We mentioned in our 2018 Managed Futures Outlook to beware the managed futures programs who may have ‘cheated’ a bit over the past few years by adding more short vol and long equity exposure, in a sort of ‘if you can’t beat ‘em, join ‘em’ mentality; and some of that could be going on here. The last thing you wanted to do in the stock market sell offs the past few years was get out of your long position. The sell offs were short lived and quickly reversed, teaching any manager (or machine using AI) that it is better to space out exits and not do a knee jerk reaction to down moves. 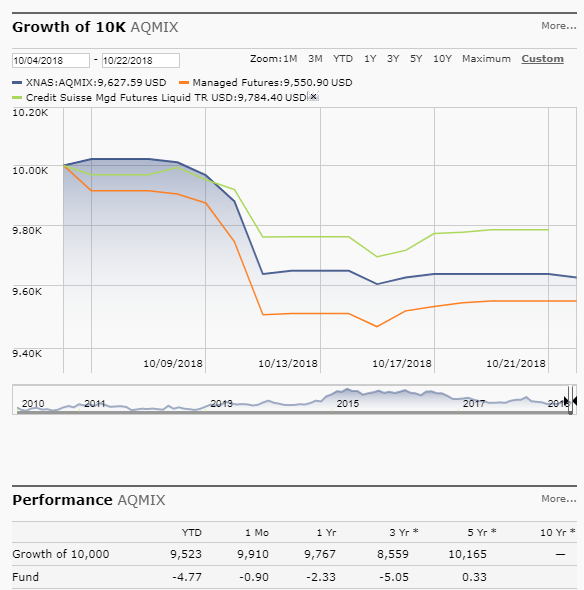 It’s more than possible that the resulting performance profile has become capturing more stock downside than managed futures and macro programs may have in the past, as well as delaying signaling a down trend. Finally, the fact that alternatives are losing money at the same time as stocks is a prime example of the confusion between non-correlation and negative correlation. We won’t blame you if correlation statistics are a little hard to wrap your head around. It’s easy to understand positive correlation (performance moves together) and negative correlation (performance moves in opposite directions), but non-correlation is a bit harder to grasp. Just what does a -0.06 correlation look like, anyway. How do we conceptualize a lack of correlation one way or the other? Most of us incorrectly conflate negative correlation with non-correlation, but the reality is that non-correlations really just means sometimes positively correlated, sometimes negatively correlated. As we showed in an in depth post on correlations, here’s what that sometimes positive, sometimes negative correlation looks like over time. So we were up at one of those positive correlation peaks before this market sell off. That’s bad news. The good news, if markets keep going lower, we won’t remain there for long, with models reversing and taking on short positions as correlations move into negative territory. For now, this sure seems like a bit more of a real down move than previous times during the now 10yr old bull market run.